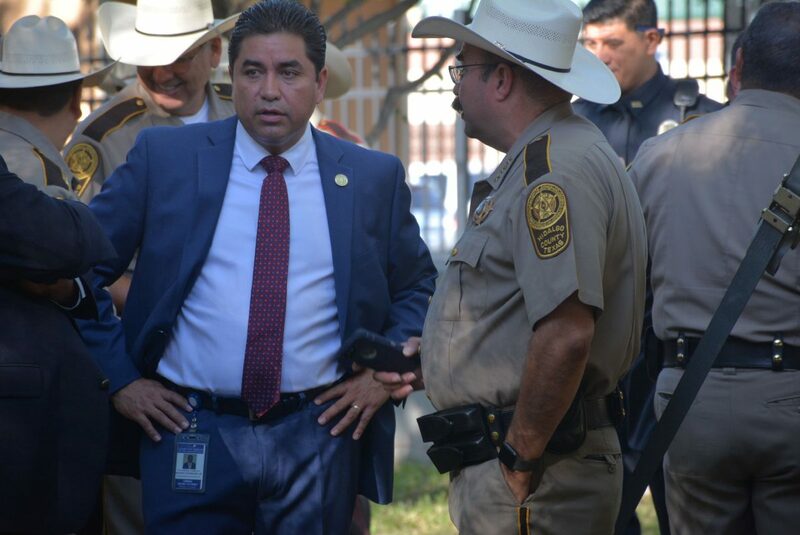 Hidalgo County Criminal District Attorney Ricardo Rodriguez Jr. speaks with Sheriff J.E. "Eddie" Guerra. EDINBURG — The county is holding its fourth annual “No Refusal” initiative over Labor Day weekend to crack down on drunk driving, the Hidalgo County District Attorney’s Office announced Tuesday. Anyone suspected of driving under the influence of alcohol or drugs during the five-day campaign, which runs from Thursday through Monday, will be subject to a search warrant if they refuse to provide a breath or blood sample. “During the No Refusal Labor Day Weekend campaign, all Hidalgo County law enforcement agencies will provide more resources and manpower on the road … judges will be available to review search warrants and nurses will be ready to draw blood,” Hidalgo County District Attorney Ricardo Rodriguez Jr. said. During last year’s campaign, 113 people were arrested on driving under the influence or driving while intoxicated charges, according to Hidalgo County Sheriff J.E. “Eddie” Guerra. Twenty-eight of those arrests were made by sheriff’s deputies, the sheriff noted, and six of those refused a breath sample, resulting in a warrant. Sheriff’s deputies, constables and police officers from all of the counties’ municipalities will be assisted by troopers with the Texas Department of Public Safety during the campaign.